There was a time when buying a movie ticket meant simply deciding which movie looked good. But right now the biggest question any moviegoer faces isn't which movie to see, but how to see it. 3D is the innovation of the moment and Hollywood, hungry for those higher-priced ticket dollars is flooding theaters with funny glasses. When faced with a choice between seeing a movie in 2D or 3D, going 3D might seem like a no-brainer but 3D tickets are expensive and getting more expensive. Worse, not all 3D movie experiences are created equally. In some cases, you might be better off saving your money. To help, we've developed an unbiased, seven-point system for determining whether a movie's 3D is worthy of your wallet, and applied it to Shrek Forever After. If you want an opinion on the movie itself, wait for my review later this week. That's not what this is about. My intent here is to ignore the quality of the film as a whole and instead give an unbiased analysis of the movie's 3D on a technical level. Using that we'll give you the tools you need, should you choose to see Shrek Forever After, to buy the right movie ticket at the right price. Ready? Here we go. 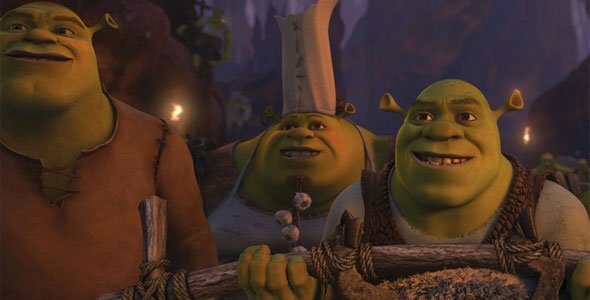 In theory, Shrek Forever After is a perfect candidate for 3D enhancement, since it's a computer animated film, and 3D always works best on computer animation. It's why all the foliage out in the Pandoran jungle in Avatar seemed to pop off the screen so much more readily than the live action elements back at the base. But while Shrek 4's format works well with 3D, the story doesn't. Part of the reason computer animation works so well with 3D is that it usually uses bright, sharply defined colors; colors which are much more striking than anything you'd normally see in nature. Unfortunately, much of Shrek Forever After's story takes place at night, in the dark, which mutes those colors and takes away much of the sharp, brightly defined palette needed for 3D to work its magic. And unlike Avatar, Shrek Forever After doesn't have a bunch of neon yucca plants to light up the night. Unlike Clash of the Titans, which was hastily converted to 3D after the fact, Shrek Forever After was planned as a 3D film earlier in its development process (though I doubt the script was written with 3D in mind). This is the first Shrek film to actually be shot in 3D stereoscopic vision and DreamWorks Animation even went so far as to hire Phil McNally, who worked on the spectacular 3D effects for Disney's Meet the Robinsons, to head up their ogre sequel's 3D effects. 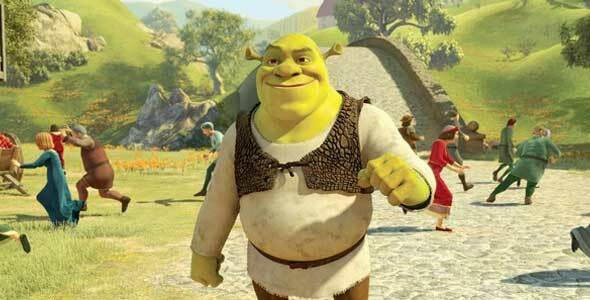 DreamWorks Animation has declared that all of their movies, from now on, will be released in 3D. Expect this kind of early development planning to be the minimum on all their future movies. It's not exactly Avatar level effort, but at least they thought through what they were doing. Modern 3D is, of course, about more than just throwing stuff at the camera to make the audience duck. When used properly 3D can be used to provide depth for a movie, giving its audience the impression that they're watching something happening right outside a window. Shrek Forever After does this only sporadically. Some of the action sequences have depth to them but the movie's more intimate moments seem mostly flat. Worse, parts of the film seem as though they were specifically designed to be in 2D, mimicking television pictures or newspapers which don't have any depth at all. Even scenes that do have 3D depth don't really seem to need them. 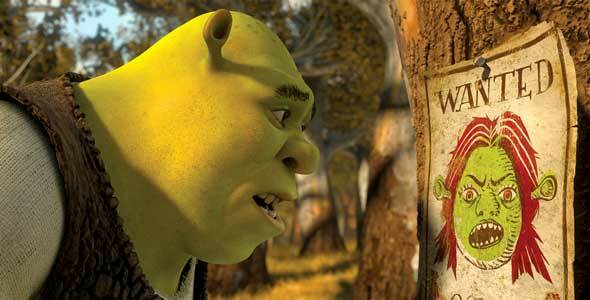 Shrek's medieval world always feels as though it's two-dimensional even when it's not. 3D glasses are basically a filter, a filter which reduces the brightness of the picture in front of you as a side effect of fooling you into seeing in three-dimensions. To some extent it's up to the movie theater you're seeing it in to compensate for this, by turning up the brightness on their projector. But it's also up to the filmmakers too, to plan for 3D by using brighter than normal colors and adjusting the lighting in each scene to compensate for the filters they know will be over the audiences' eyes, maybe even in sub-standard theaters where the projectionist has neglected to turn up the brightness. Shrek Forever After fails miserably at this. Much of the movie takes place in the dark, and the filmmakers have done nothing to account for this by adding glow bugs to light up the scenes (as done by the very 2D Princess and the Frog) or by coming up with some other creative method to make sure the audience can see what's going on. Worse, the movie's green. Very green. 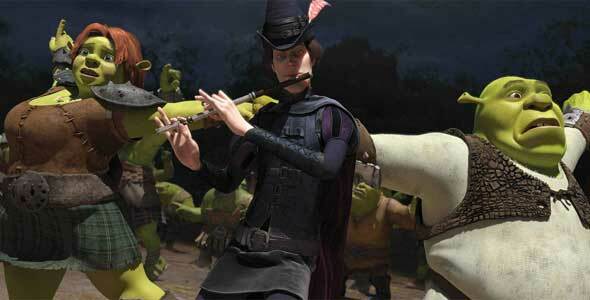 This time around Shrek's surrounded by an entire army of ogres. And those ogres are fighting a bunch of green witches. And they're fighting in a very green forest. It all starts to run together when seen beneath the unavoidable 3D haze. While I have no doubt that the movie looks colorful and brilliant in 2D, watching Shrek Forever After through those 3D lenses means spending most of the movie squinting. Picture depth is great, but as long as you're making a 3D movie, it can't hurt to have a little fun with the format by throwing in a few of those “stuff flying at the audience” moments. It's a sign that, at the least, your movie is trying to entertain. 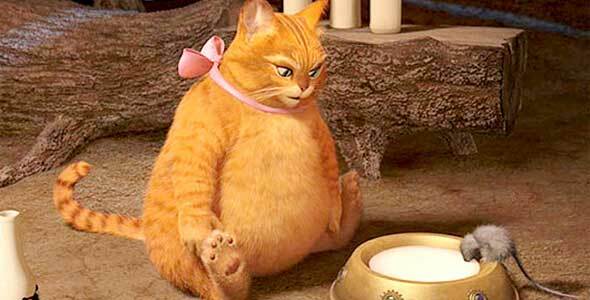 And Shrek Forever After, whatever it's flaws, is at least trying to entertain. Director Mike Mitchell doesn't make a habit out of waving things at his camera but his movie does contain at least two capably executed “whoa” moments which made the kids in the audience I saw it with duck. Good enough. This is hard to gauge since it's really only anecdotal and different people will be affected differently. As a result, this should probably weighted lower than some of the other factors being considered here. But the truth is, the worse the 3D, the more likely it is to make people sick. In this case I heard no complaints from moviegoers exiting the theater. This is somewhat surprising since Forever After lacked the proper brightness necessary for good 3D and a dimly lit movie can often result in eyestrain and headache. 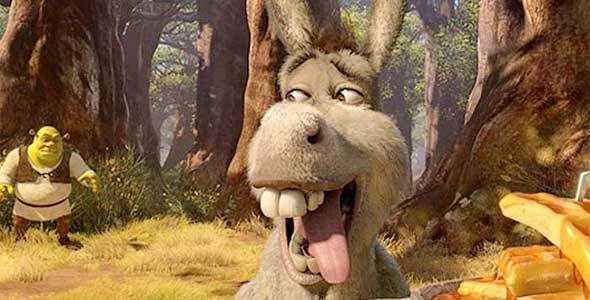 But the film is short enough to avoid 3D fatigue and it's obvious that, even though it's not really a fit for this particular movie, DreamWorks spent some money and time on the 3D production for Shrek Forever After. It's enough that the film doesn't seem to cause the more extreme cases of nausea, headache, and dizziness common to some inferior 3D films. If you take your glasses off during a great 3D movie, you'll notice that during the most 3D intensive parts of the film the picture becomes even fuzzier. The simple way to explain this is that the blurrier the image on screen appears when your glasses are off, the deeper and more vibrant the 3D is likely to be with your glasses on. So to test this, I removed my glasses periodically during Shrek Forever After to examine the way the movie's 3D effect was being created. The result? Disappointing. 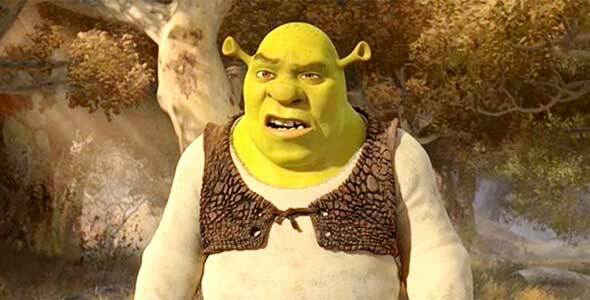 The truth is that some parts of Shrek Forever After don't appear to be in 3D at all. During those sequences, removing my glasses actually improved the picture since it resulted in brighter, more vibrant colors. During the parts that were in 3D, the distortion was minimal (or perhaps negated by the darkness of the picture), even during action sequences which are, normally, where filmmakers blow their 3D load. Final Verdict: Even though it was shot with 3D in mind, I don't believe it was written with 3D in mind. The filmmakers behind Shrek Forever After were never able to compensate for that and because of it, their film doesn't really work in 3D. In fact, since the colors will be brighter and more vibrant, it's almost certainly a better movie in 2D. Save your money and buy a 2D ticket. For more analysis, visit our To 3D Or Not To 3D archive right here.